Nothing beats a homemade brownie. Don’t get me wrong, there are some pretty good box mixes out there but none of them are as good as chewy, gooey, glorious homemade brownies. The problem with homemade brownies? Well, there are three, actually. For one, many of the recipes I've seen call for melted chocolate. Which I’m sure is delicious. But when I’m just looking to whip up a quick batch of brownies, melting chocolate ain't on my agenda. Plus, baking chocolate isn't something I typically have around the house. Second? Most recipes make small batches. And lemme tell you something… I’m not turning my oven on for one little 8x8 pan of brownies. If I’m cranking that puppy up, I’m getting my money’s worth. 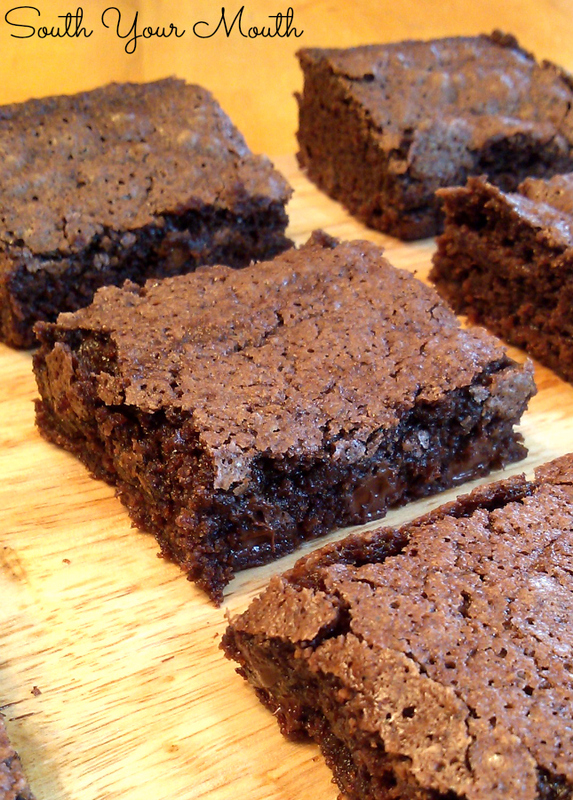 And third is that many homemade brownie recipes are just too fussy. Some want you to use boiling water. Some make you mix up a cocoa “sauce” separately. Some want four drops of unicorn tears. Ugh. I just want some brownies. I want to open up my cabinet, pull out a few ingredients and make some simple brownies. So, that’s what these are. Super simple, super easy brownies made with ingredients you probably have in your kitchen right now. Like, you could literally go to your kitchen and make these. Right now. Make you some brownies then! The only two somewhat fancy steps I take are to sift the cocoa and flour and to use half melted butter and half vegetable oil. I sift the cocoa with the flour because cocoa tends to clump. I use a combo of butter and oil because each brings something to the table. We want the richness and flavor from the butter and the moisture from the oil (vegetable oil makes brownies moist and chewy). Sift together flour, cocoa, salt and baking soda; set aside. In a large mixing bowl combine eggs, vegetable oil, melted butter, sugar, vanilla and coffee and beat on low speed until well combined and smooth. Slowly mix in flour mixture and mix until just combined. Stir in chocolate chips and nuts (if using). Spray a 13x9 baking pan with cooking spray then spread brownie batter evenly into pan. Bake at 350 degrees for 35-40 minutes or until toothpick inserted in the middle comes out clean. Thank you, these look delicious. I'm going to make a batch tonight. You're not kidding - I do have everything! I wish I had the energy to make them tonight, but it was Meet the Teacher so I've been at school since 7 and I just got home. Definitely will make them this weekend while we are watching football! Thanks for another great recipe. You are absolutely hilarious! I totally agree with you on the 8x8 pans and crazy steps and ingredients like unicorn tears!!! You always stick something in that makes me laugh! I have enjoyed your cookbook and your humor! Made these this afternoon - they are fantastic! Loved that I had all the ingredients on hand! Thanks for another great recipe! try not to leave out the coffee if possible (for those reading).. it brings out the flavor of chocolate. Learned that from a famous chocolatier, and Ina Garten also uses it in her famous chocolate cake. I don't drink coffee, so I keep a small jar of instant granules in the freezer just for stuff like chocolate recipes...l hope that helps. Sweet Baby Jesus...that's all I have to say. First I have never made homemade brownies because in the past every single one that I have tried (when someone made them) SUCKED! Not these! Oh emm gee were these good! I was skeptical about the coffee so thank you Terri for saying not to leave it out. I will never second guess you again. These are going down in my drawer for every single time I want brownies. Thank YOU! I've been looking for a brownie recipe with a crunchy top and moist & chewy inside and I think I found it! Making these for tonight's dinner! Oh my, these are the bomb!! And yes, make sure you add the coffee, it gives them what my husband calls the "grownup brownie". I will never buy another boxed mix. Thank you!! Finally tried this recipe. FINALLY a brownie that lives up to what I am looking for. These do sound wonderful. I wrote up a short post on chocolate paired with raspberry wine. I found your recipe and recommend it as a another thing to try with the wine.